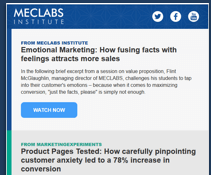 MECLABS Institute and its family of brands, MarketingSherpa and MarketingExperiments, are committed to respecting and protecting your right to privacy. We will not rent, sell or barter your email address or other personal information to anybody unless you grant permission for this information to be shared with a sponsor in exchange for sponsored content. Sponsored content may include but is not limited to file downloads, videos and reports. We will never send you an email blast on behalf of a third party. Furthermore, we will only send you emails related to any specific newsletters or topics that you explicitly signed up for with us. As a newsletter subscriber, we may send you very occasional invitations to participate in research questionnaires and to review the resulting data, or exclusive promotions for our offers and events. However, you can use our preference centers to add your name to our suppression “Promo Do Not Email” list. This is separate from our editorial newsletter lists, so you can be signed up for our newsletters but stop all promotional sends. If you have questions, or concerns about your data and would like to change the way it is being processed or obtain the personal data for your account, please email us at service@meclabs.com.